DEBORAH CROMBIE: I know that those of you in northern climes have probably forgotten what spring looks--and sounds--like. Even though we haven't been covered in snow (at least not yet...) our garden has been so brown and sere that the other day I was tempted to look at photos from last summer, just to remind myself that in a few months it would be beautiful again. Then, walking around the back garden, I saw the first shoots of the fire tulips peeking through a layer of dead leaves. 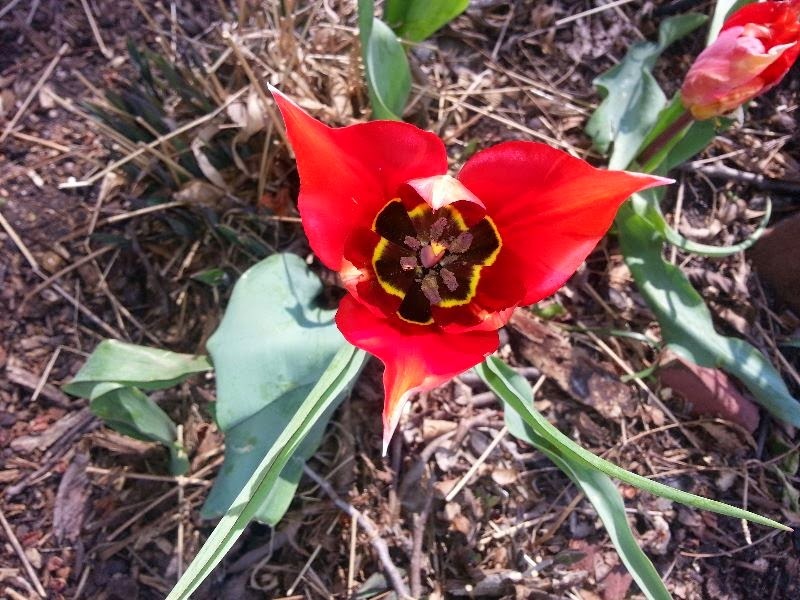 This is the only tulip that naturalizes here, and they are apparently quite rare. Our little patch came with the house, so we have no idea who planted them, or when. But they are gorgeous. You can see why they're called "fire tulips." I've tried to find more but without success, so I always look forward to our few hardy bulbs. 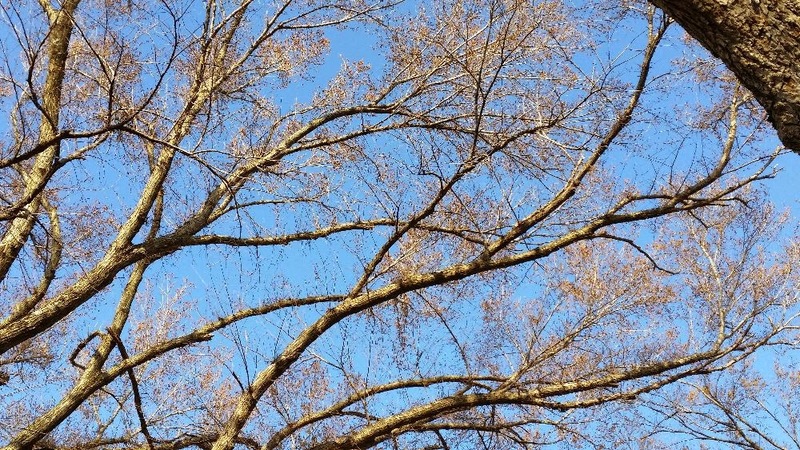 And then yesterday at dusk I was out back with the dogs, looked up, and saw that our huge elm tree had begun to bud, just since the morning! The leaves looked like a canopy of tiny brown feathers but in a day or two they will be the palest green. We have a few warms days in the forecast, but even though the cold is coming back for at least another month, it is really SPRING. So, REDS, what are the first things that tell you the season has turned? HALLIE EPHRON: So jealous. And that's all I have to say on the topic. We're getting more than another foot of snow. I'll know the season has turned when I can see my bird bath. Right now it looks like a snow mound. SUSAN ELIA MACNEAL: So jealous here, too. We still have snow on the ground here in NYC and another winter storm forecast for Tuesday. First signs of spring here? Snowdrops and crocuses in the gardens of brownstones — sometimes as early as March, definitely by April. RHYS BOWEN: I hardly like to add to this because I'm in Arizona where winter consists of a temperature drop at night and about four days of rain. But the birds are singing like crazy in the trees around our condo and the tree outside my window (not sure what it is) has definite green buds. The first desert wildflowers usually show up in March and then it's a carpet of yellow and orange if there has been enough rain. One thing I miss spending the winter here are the fantastic wildflowers in California. When I went out to Point Reyes in spring it was a multicolor carpet of poppies, lupins, Douglas iris and more. One friend described it as walking through God's garden. HANK PHILLIPPI RYAN: BWA HA HA. Spring. Yeah, you saw my bird bath photo last week right here--the topiary, remember? Let me put it this way: the cab that brought me home from the airport today could not get up our driveway, and had to leave me and my suitcase in the slush bog at the bottom. Then I could NOT roll my suitcase up the driveway, because the snow was too high. My first signs of spring, of course, are the DUCKS! Right now, however, they would be baffled--you cannot even see the outline of the pool in our back yard, the snow is so high. JULIA SPENCER-FLEMING: It wouldn't be unripe, rotten tomatoes, Lucy - just canned ones that have frozen solid in the pantry. (Not exaggeration - our walk-in pantry, once the Salmon Falls Post Office in the 19th century, is poorly insulated, and things will freeze in there during a harsh winter.) Our first signs of spring will be crocuses in the back yard and the forsythia - which you all may remember I spent most of last summer hacking back - blooming. In warmer climates, their delicate pale yellow flowers would be overlooked, but in New England, they are the oh-so-welcome evidence that winter is really over. They've been rather scraggly the past several years as they became overgrown; I'm hoping my vigorous pruning will pay off with some nice full sprays this spring. Which, judging by the current Maine weather, will arrive sometime in late June. DEBS: Oh, Hallie, Susan, Hank, Julia! I don't even want to tell you that it was warm enough today that we gave our dogs baths on the deck. (We have hot water plumbed outside--the water would have been freezing otherwise.) But don't be too jealous, because it won't last. And we have had snow in mid-March here. Susan, I love crocuses, too. They remind me of Cambridge. And guess what I saw as I walked round the back garden this morning? The very first one! Proof that spring will come! 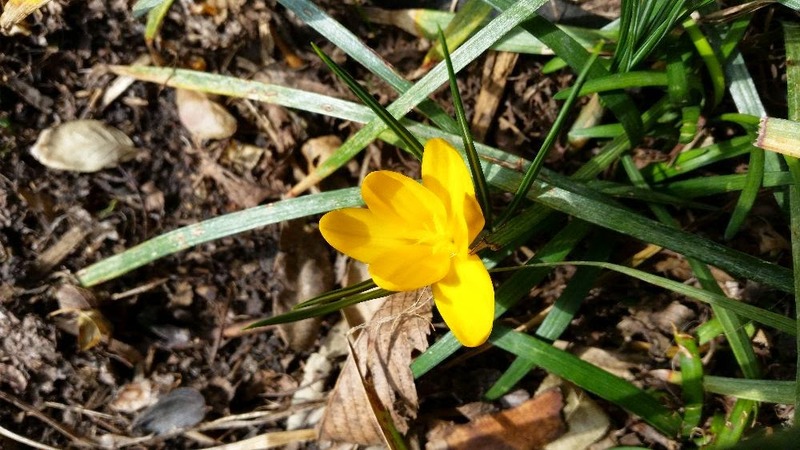 READERS, what's your first sign of SPRING? Daffodils, of course, although they always come early and rush away far too soon. The forsythia will bloom and the lilac bushes will bud and the snow and ice will become a distant memory . . . .
Crocuses, followed by all the daffodils, but the sure sign is the huge flock of robins that appears around mid-March. They cover the backyard, side yard, and front, spilling across the road into the neighbor's yard as well. But still in hunker-down mode here in northern Ohio. Plenty of ice and snow still around and more to come. Snow drops which do come up through the last of the melting snow and crocuses beside them. snowdrops and crocuses, followed by the double yellow of daffodils and forsythia...and then flowering red buds and crabapples and cherry trees with whatever tulips have survived the resident deer population (daffodil bulbs are toxic to rodents and deer, but tulips are a gourmet snack). Daffodils and forsythia. But right now that seems impossible as we received 8 inches of snow overnight with more to come today. This is stunning, Deb, in a good way. Texas is a long way from Maine, but this post offers hope, so thank you. Spring seems far, far away here. While we have cardinals (and finches, and chickadees and the odd Carolina wren) around our feeders all winter, they are not singing their sweet spring songs. As for tulips and crocus? Not for another two months, maybe more, but it was lovely to see yours. It's snowing. STILL! It's pretty amazing here..
Like the others, snow-drops and crocuses - I have a tiny patch of crocuses at the back corner of my house that have always been there. And there's a patch of daffodils in the backyard. I love tulips, but the deer always eat mine. And yes, robins! When I walk out my back door and see a bunch in the yard, I know warmer weather is at hand. I remember the joy of forsythia from my childhood home. Saturday was really nice - sunny and warm. But they're calling for rain/snow and falling temperatures the rest of this week. Sigh. No spring here yet. First sigh of spring here is the emergence of a dry sidewalk from its ice cover. Not happening yet. Julia, if you aren't going to insulate the pantry (you can buy sheets of pressed styrofoam board that you can tack up that will help), then you should leave the pantry door open on cold nights-- they tell us to do that with our under-the-sink cabinets if the sink plumbing is on an outside wall. But if your pantry freezes canned goods in winter, it is probably (dangerously) overheating them in summer. Put up insulation and replace the door with a louvred one if you don't want to leave it open. I have lived in a few different climates. In Northern California, some days I would forget what month we were in -- ideal climate! In the DC area, we generally saw signs of spring by late February -- with a possible March storm. Spring would unfold flower after flower -- forsythia, daffodils, tulips, . . . SIGH. Here on Cape Cod I have gone into May some years without seeing a bloom. Ugh. First let me say I miss those northern signs of spring, the early greening of the shoots, the pointillist look of the trees in early spring. Sigh - here in south central Florida spring means the scent of orange blossom in the air and a certain different quality, almost a taste, to the air. In South Florida spring arrived with afternoon rainstorms that continued through the summer months. Yes, even Florida has seasons. I'm still praying for lots of rain here in CA. We really need it. We got a good dose in December, but almost nothing since then, and we are in a bad drought as it is. So all of your in New England, send your precipitation to us. Although I would prefer that it come in the form of rain, at least in my town. I think I will be in London when my fire tulips bloom. But I'm hoping the fruit trees will be blooming there, and the crocuses and daffs abloom in Hyde Park! Mark, we're dry here, too. Although it seems like we've had quite a bit of rain this winter, it's not nearly enough. Wouldn't it be great if we could move precip from too-much to too-little? Kait, I love Florida, and know what you mean about the difference in the air. It was downright chilly when I was in Fort Myers a few weeks ago--but I'd go back! Robins, yes, also egrets, red-winged blackbirds, grackles...can you tell I'm a bird watcher?! Mark, I'm not sure you want all our precipitation, even in CA. As Hank says, it's still snowing up here, with more storms expected on Thursday, AND Sunday, AND likely Tuesday next. It's getting to the point where someone will have to get out of the car at the bottom of the drive to see if there are any vehicles coming - because you can't see over the snowbanks to the road while seated. Over the weekend I saw my first shoots too! They're my first signs, and the robins will reappear soon too. Julia, try a piece of plywood cut to size over a sheet of insulating styrofoam (also cut to size) on the floor. And maybe a rug on top of that? When we put in the basement drywall, I thought that the cement blocks under ground level would be insulated by the ground and only insulated to top part. Oddly, the top part is quite warm, even though the other side of the wall is exposed to the weather, but the bottom part (where the ground is) is always quite cold. So I have become a believer in insulating every outer wall, whether above or below grade. Buds on the big tree out front and crocuses are the first signs here. 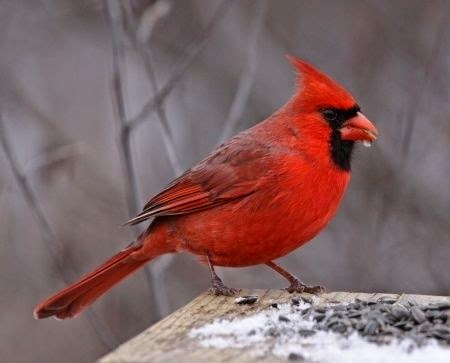 The robins and cardinals hopping around the yard and the wonderful birdsong like you, Debs, provided in the link. I had forgotten about that site, so thanks for reintroducing it to me. Such a beautiful song the cardinals have. Julia, I just want to say that you have a really cool house, no pun intended. I love places and things with history, and your pantry is an awesome piece of history. Deb Romano, I'd love to hear more about your bird watching. I've often thought I would enjoy it. And, how often have you heard, "egrets, I've had a few, but then again, too few to mention"? Hehehe! sorry about all the extra snow you guys. sending warmest thoughts--it WILL be spring soon! I'm not far from Rhys. 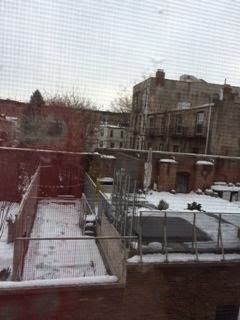 But I do miss back home in Massachusetts where friends and family have no place to put the snow they have to shovel. New fallen snow creates a peaceful quiet. I miss. I miss. I miss.